You want me to play this how? Hilarious stories of what happens when instrumentalists are faced with dynamic instructions which make NO SENSE for their instrument. It's been SO nice. I desperately needed to take care of myself, and I did a lot of that today. Sorry I've been so terrible about posting (again). I keep meaning to be good, and then I'm not. I know two people who are directly affected by the dratted government shutdown, which is on day 28 (the longest in history, over border wall funding). One of the two works for NASA and it is a felony for her to go into her office. The other doesn't work for the government in any capacity, but her office is inside of a government research lab and she hasn't been able to get into her office for a month now. She would really like to be able to do her job! Fortunately she's got a second job that she can put more hours into while the shutdown continues, but it's a soul-sucking position. Meanwhile there are lots and lots of people being forced to work without pay, which is starting to affect the economy, etc... What a country. The work going on in my group is getting exciting and cool, and I'm looking forward to getting back and being a part of it again. And the sewing project I'm working on right now is coming along well; I think I'll have energy a little later today to actually do some work on it, which would be nice. Some things do not hold up over time. I remember being COMPLETELY ENCHANTED when I first saw The Neverending Story in theaters. The puppets! The characters! The story! Magic breaking into the everyday world, or someone Very Like Me escaping into a world of magic! It was all just amazing and wonderful and transportive at the time. With those fond memories in mind, I put it on again last night (currently on Netflix). I discovered that the eyes and experience of a 40-some year-old are very different from an 11-year-old. From an adult point of view, the story is one that I've now read or seen in a few hundred books and movies. This particular iteration of the Hero's Journey isn't very deep or very involved. The dialogue is simple and not particularly witty. The puppets were probably pretty impressive at the time, but lip-synching is an issue and they're just not very convincing anymore compared with today's CGI wonders. It was a film of its time, and it was aimed squarely at kids. Which was fine when I was eleven, but sadly doesn't work so well now. In contrast, while I haven't seen them all that recently, I believe films like Labyrinth and Dark Crystal hold up better to adults, perhaps because they're targeted more towards teenagers than children. Similarly, The Princess Bride, while pretty goofy, is still very watchable. It was sort of worrisome to behold. I figured anything that had left that crazy a smoke trail can't have had a good ending! Fortunately the consensus is that this was a noctilucent cloud left behind by a meteor/meteorite. It must have been quite high up - it was seen in Sacramento and Lake Tahoe. YouTube must know what field I work in. It's showing an ad for an orbital shaker (good for growing bacteria, yeast, and other single-cell cultures) before showing me the video that I want! A quick post to note that the smoke from the Camp Fire up in Butte County (burning since last Thursday night) reached Very Unhealthy levels in our area yesterday, and is predicted to do the same today. Several school districts have closed schools today due to the poor air quality, and Stanford has cancelled classes. I am basically okay but am having a lot of congestion and irritation from the smoke. I'm really grateful for my little steam inhaler which I bought a couple of years ago for a bout of bronchitis and which I will now swear is full of miracles. It REALLY helps, and keeps me feeling better for hours and hours and hours. There's a big wildfire up north of Sacramento, near Chico. Our weather comes down from the north, and this morning the light looked really odd. If you step outside, you instantly smell smoke - lots of it. Because research in my building involves lots of chemicals, the building is required to have air from the outside circulated into the building to keep the air 'fresh'. I'm really not looking forward to breathing smoke all day! This recipe was my version of a recipe I saw on Tumblr which I can no longer find, more’s the pity. It assumes you’re going for a bunch of noodles rather than a bowl of soup. The main trick here is to re-use the egg-boiling water for the ramen and veggies. My chamber choir Convivium hosted a group called The Queen's Six for a workshop and concert last weekend. The Queen's Six is a professional six-member male a capella group that live in and sing at Winchester Castle. It was a really wonderful concert! Here's a video of them doing one of the pieces they sang last week (they commissioned this piece as part of their 10th anniversary celebration). And here's a video of Convivium singing Melissa Dunphy's O Oriens to open that same concert! I've started watching Forest of Piano on Netflix. I'm just two episodes in, but I'm enjoying it. It's similar in feel to some sports anime: you have The Brilliant Kid, their Close Friend and Competitor Who's Good Because They Work Really Hard, and given the opening credits we'll probably meet Other Competitors soon. It's a nice change from my usual action-adventure fare. The fate of the world isn't at stake, and the piano playing is really quite good. Anyway. In G+, I could get an image included easily if I link to a tumblr post. I'm guessing here I need to work at it? 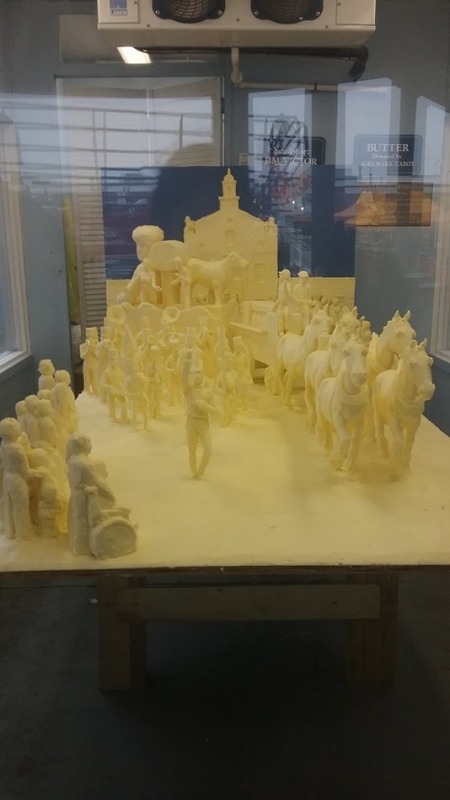 Cool post at scifigrl's tumblr with an Insane Butter Sculpture here. I saw a post on copperbadge's tumblr about an exploded pressure cooker, which prompted me to write up a memory from my youth. My grandmother had a big house down on Cape Cod where she lived during the summer, and my family would generally go down a couple of times a summer. This particular time, I’d invited my best friend E along as well. I should say in my own defense that I know essentially nothing about how to cook large hunks of meat. At home such things were roasted, either in the oven or on my dad’s kettle grill (aka the best way). It may in fact be possible to cook large hunks of meat in a pressure cooker and not have it end up inedible. I just don’t know. My grandmother stuck the pot roast and some water into the pressure cooker, closed it, stuck it on a burner, and turned the heat on. Most of us were sitting out on the back porch watching the sunset. At some point we noticed that in addition to the salt smell of the water below, there was a rather different smell coming from the house. The pressure cooker had gone completely dry - maybe it hadn’t been sealed correctly - and the object within was burned black. I have no idea whether it ever occurred to my grandmother that not serving the pot roast was an option. In any event, served it was. I think we must have gotten the smoke out of the house by the time dinner was served, because I have no memory of smelling smoke during dinner. Or maybe there was still smoke in the air, but my sensory memory of that meal was entirely and completely overshadowed by the bite or two of dry, gritty, burned material boldly masquerading as pot roast. My mother told me later that my friend E gave her a look and whispered, “Do I have to eat it?” to which my mother (a reasonable person) whispered “No!” in response. My father, dutiful son that he was, ate his entire portion. I think my grandmother must have gone to bed early, because once she was out of the picture the rest of us piled into the car and salved our poor taste buds with the sweetness of ice cream. powerd is currently sucking ~35% of CPU and everything is slow as hell. And will be till I reboot again. The new computer cannot come fast enough, dammit. Hi! I've been terrible about posting here, I'll try to be better. My computer is getting old and developing quirks as it ages. One of its other quirks is that Google Music Manager sometimes has issues connecting. After a restart, I came across the issue again this morning, and finally clicked the "More Info" link to see if I could find anything out. It brought me here. Open Music Manager and click on the window that appears. Using your keyboard and arrow keys, press: up, up, down, down, left, right, left, right, b, a. A new window will open. Click Open browser and follow the prompts to log in. Copy the code that is displayed, then return to Music Manager, paste in the code, and press Submit code." The key sequence is, of course, the Konami Code, used for cheats in various Konami video games ages and ages ago. I'm highly amused that Google has integrated it into at least one of their apps! - Thomas figured out how to jump from the top of one of the gates onto (sigh) the kitchen counter... the one next to the stove. - They both managed to get up onto the chairs by the kitchen table. They think the bathroom is totally awesome. They love to claw the rug, and they think that having Thomas get up on the tub wall and hide between the plastic shower liner and the decorative curtain while Luna plays with the moving decorative curtain is just the best thing ever. As pretty much all of you know, Huz and I have had cats for years. Back in March, we lost Fluffy Cat (memorial post yet to be done), bringing us down to just one cat for the first time in our lives. [Gasp!] Penny Cat clearly missed her feline companions, and we knew we wanted more cats. So yesterday (5/20/17), we brought home two 2-month-old kittens from Peninsula Humane Society! This little girl was named Pinta back at the shelter, but we've named her Luna. This little boy was called Santiago at the shelter. We're not 100% sure, but we think his name is Tigger. ...and how to climb onto the second pantry shelf. Penny Cat is not entirely pleased by the invasion of these new felines into her territory, but she hasn't done anything worse than hiss and growl at them. We'll keep you posted as new developments occur!